Yesterday, I posted about the Cross of Christ in Groom, Texas. I hope you enjoyed the photos. While that was the highlight of our day trip, there where more things to see and do. Today you get the rest of the story. 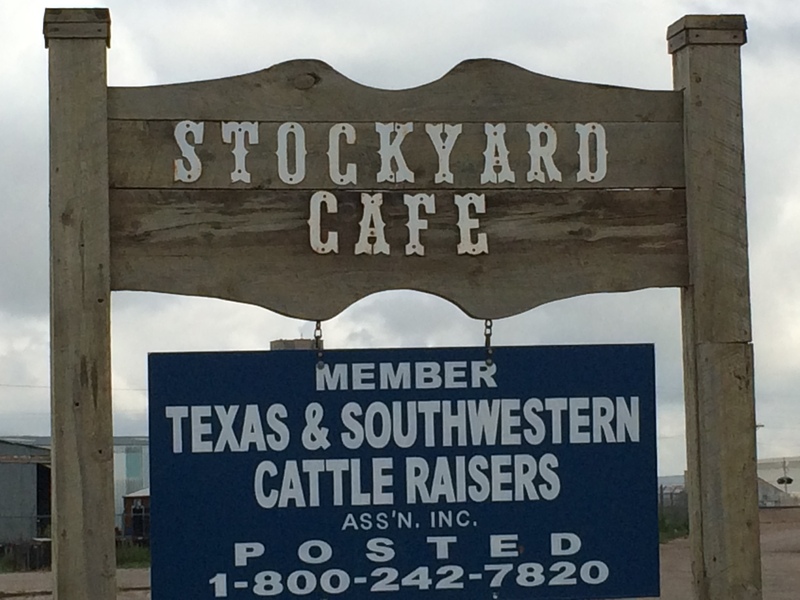 We started the day with breakfast at the Stockyard Cafe. This quaint cafe is located in the Amarillo Livestock Auction Building. The Amarillo Livestock Auction operates the largest independent livestock auction in Texas selling over 100,000 head of cattle annually. We will have to visit this auction but will sit on our hands. Breakfast was good enough for us to say we will go back. They advertise a tasty looking Chicken Fried Steak dinner that I will have to try out. Groom, TX lies about 40 miles east of Amarillo on I-40 along the route of Historic US-66. The city occupies less than 1 sq.mile and, based on the 2010 census, registered around 600 people. Groom was named for Colonel B. B. Groom who leased over 500,000 acres and purchased 1,300 short horn cattle in 1882. Unfortunately, this was a failed venture that resulted in foreclosure in 1886. The city was platted in 1902 along the Chicago, Rock Island and Gulf Railway route. 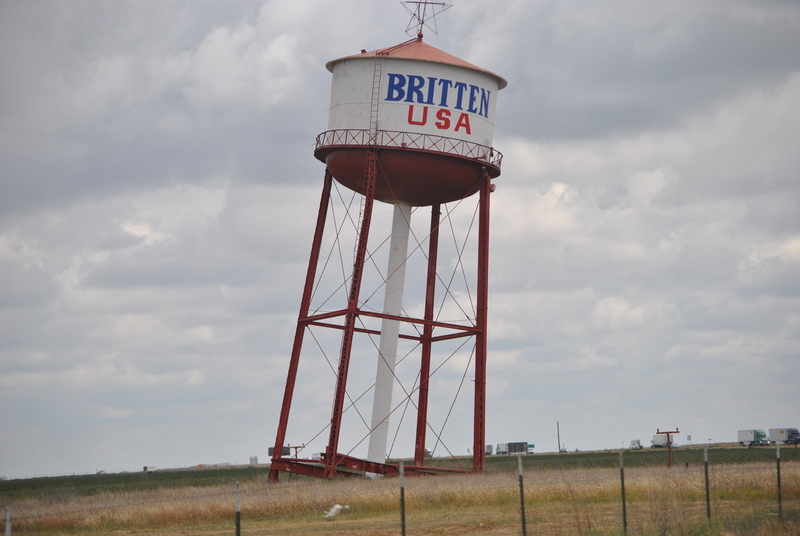 On the north side of I-40 near exit 114, sits an old water tower. Normally this would not be of interest to anyone except this water tower leans like the Leaning Tower of Pisa. The Leaning Tower of Groom was a marketing ploy of Ralph Britten in the 1980’s. He figured if people saw a tower that looked as if it was about to fall over, they would pull of the highway and tell someone. When travelers pulled off the highway, they would find themselves in the parking lot of Britten Truck Stop and Restaurant. About 5 years later, an electrical fire permanently closed Britten’s business. Today, the Leaning Tower of Groom is all that remains. 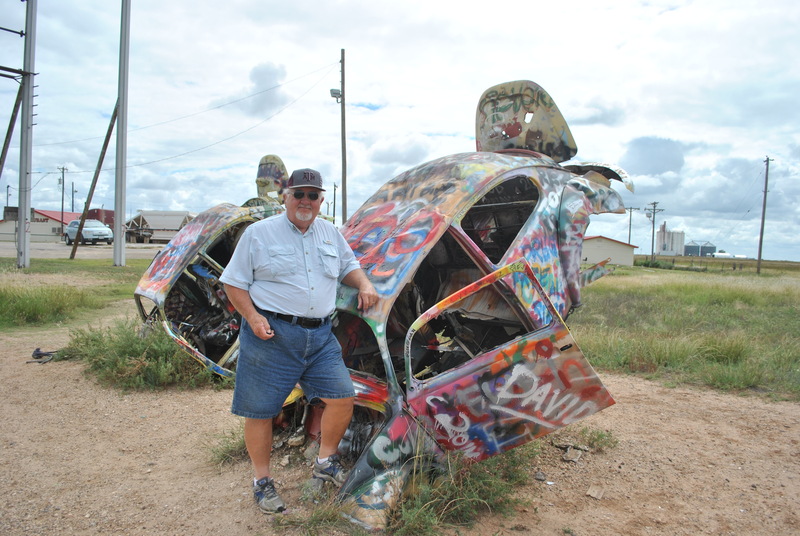 On the west side of Amarillo, travelers will spot the infamous Cadillac Ranch where 10 Cadillacs are buried in the ground. 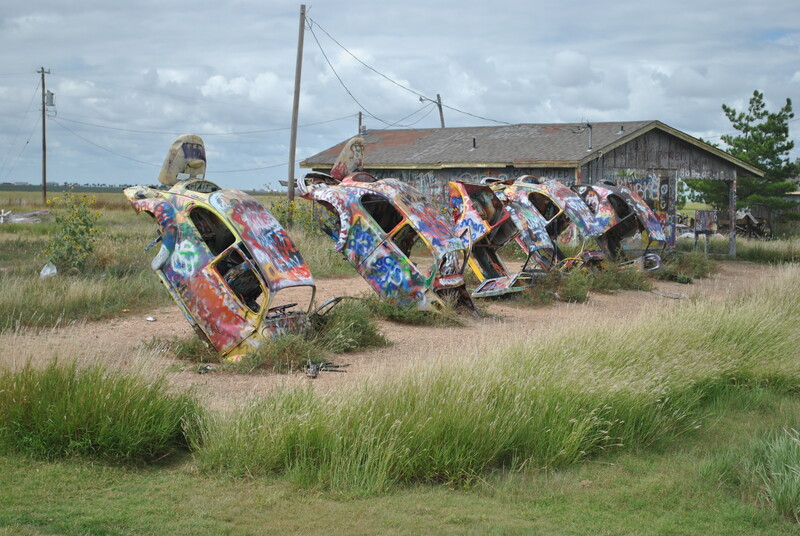 Not to be out done, the Slug Bug Ranch, (AKA, bug farm)) is located in Conway, TX on I-40 at exit 96, about 16 miles west of Groom or 30 miles east of Amarillo. This quirky display of 5 Volkswagen Beetles buried nose first mocks the Cadillac Ranch. A photo from 2002 shows these bugs where painted yellow. The bugs are in pretty rough shape but are easy to get to. Of course I had to take a selfie. Our last stop for the day was the United Supermarket on the west side of Amarillo. We have not been impressed with the quality of produce at our nearby Walmart so we decided to checkout a local grocery store. Carol dropped me off in front of the store to pick up a few items. 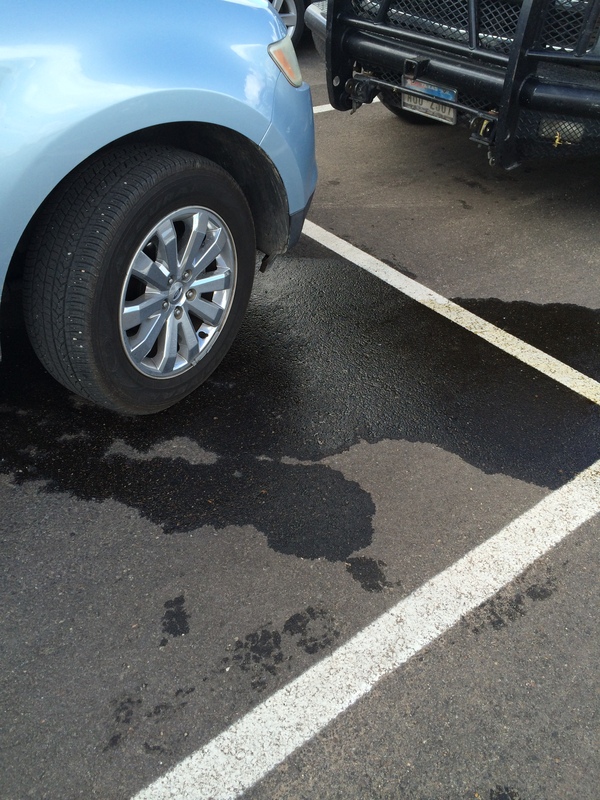 Just as she parked the car, steam billowed from the hood and coolant spewed in all directions. She called me to let me know what had happened. I continued shopping and decided we would deal with it when I got done. When I got the few groceries loaded into the car, I took a look under the hood. Things were pretty steamy under there but I could not see any evidence of a busted radiator hose. I asked Carol to start the engine so I could check for the obvious. When I saw the coolant boiling in the reservoir, I knew we would not be able to drive the car back to the RV park. We do have a bumper-to-bumper extended warranty on the car and we have towing on our car insurance so Carol called Gene Messer Ford. We could see their dealership sign from the parking lot. 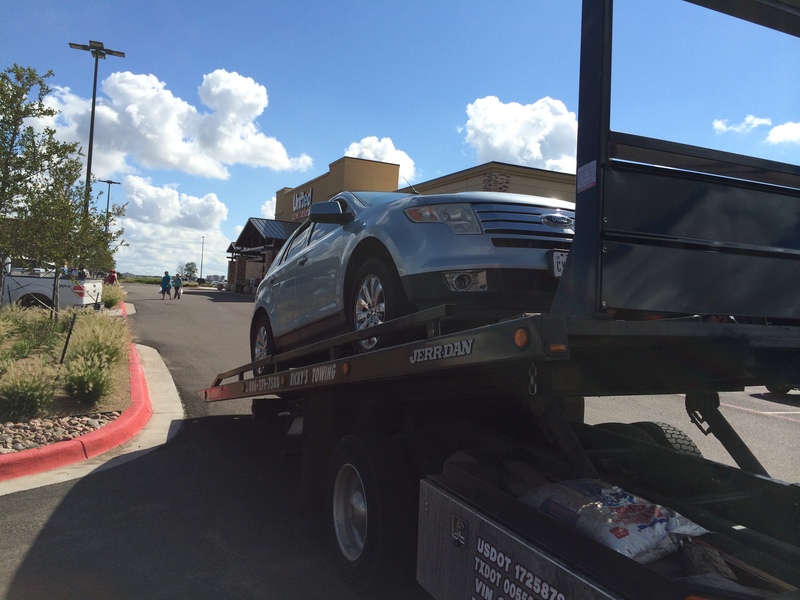 However, their service department closed about 30 minutes earlier and they did not their own tow service. SHEESH! After a few phone calls, we were able to locate a tow service who would tow us to the Gene Messer Ford and contacted our manager at Amarillo Ranch RV who would pick us up. When we got the car unloaded at the Ford dealership we though about our Good Sams Roadside Assistance policy. Perhaps it would have saved us the $60 towing bill. We’ll call Monday morning just to find out. We will be better prepared next time something like this happens. Over the last three years we have traveled over 5,000 miles with our RV plus about 25,000 additional miles without having a need for towing. Our day ended a little stressful but we managed just fine. Monday we find out what caused the car to overheat. This entry was posted in Texas and tagged Amarillo Livestock Auction, Bug Farm, Cadillac Ranch, Car Problem, Leaning Tower of Groom, Stockyard Cafe, US Hwy 66. Bookmark the permalink.